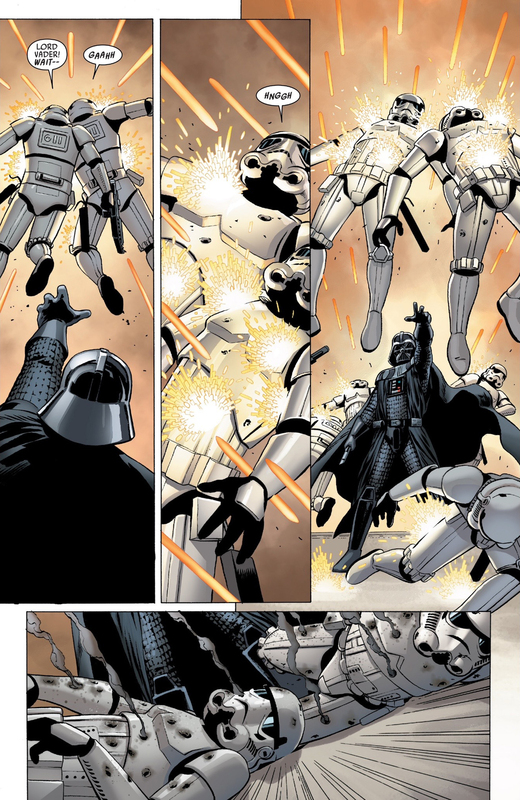 ...because Darth Vader is usually so discriminating. To be fair, we only see him onscreen killing (effectively) middle (and upper) managers who screw up at their job and people working against the Empire. He doesn't kill any generic Stormtroopers or gunners, just "named" characters. A hero for the people. To be fair, he wasn't trying to motivate, make an example of, or punish them in either case. The first poor grunt saw too much, the others were a literal meat shield. I will say, the first time I watched The Force Awakens and saw Kylo stop a blaster bolt with the force. I was impressed. They chose a good way to show how strong he is. I need to pick up the Legion Core set so I can have Vader for my ship commander project. Then he got defeated by a noob with a glowstick. I was hoping to be proud she didn't 'poke yer eye out' and then escaped, but she beat the blaster bolt stopping amazing sauce guy. That really wrecked the vibe for me. He had a burning, bleeding hole in his side from a weapon that just a few scenes before catapulted an armoured warrior 10’ in the air... give him a break. As it concerns article predictions however (it doesn’t 😁), I do want to steer things back. Squafron Reprints are “on the boat”, and it’s not entirely out of presence to get an article when they are shipping to North American retailers for a Thursday release - uou don’t ALWAYS see reprint mentions, but occasionally you do, when there’s either no other product, or it’s a heavily desired one - both qualifiers we have. Th﻿en he got defeated by a noob with a glowstick.﻿ I was hoping to be proud she didn't 'poke yer eye out' and then escaped, but she beat the blaster bolt stopping amazing sauce guy. That really wrecked the vibe for me. There was a solid reason she was able to fight him. They explain it pretty well in the TLJ novelization. It should have been on screen. When Kylo went into Rey's mind during TFA she was able to fight back because of his inexperience. By opening his mind to her, when she fought back she was accidentally imprinted with his force training. It's subtle in TFA. You'll notice the typical force sensitive tropes up until that scene, unnatural piloting, unnatural timing, visions... so on, but then she starts using skills that she shouldn't have. In context with the info above. It makes much more sense. Because of this Kylo was fighting his equal in training, equal in power (according to Snoke), and opposite in alignment... but with a crippling stomach wound. To be honest, I too was a little skeptical of it when it happened in TFA but I feel the explanation they gave adds to the film instead of just filling in blanks. I always defended Kylo in his final fight against Rey and Finn due to his what is essentially a hand cannon wound. I did not know about that imparting his training on Rey thing though. Also I know it isn't lightsaber training, but both Finn and Rey did have experience in melee combat fighting, so it isn't completely out of the question. I don't like the idea, but it does make sense and adds to the movie. I don't think they're canon anymore, but the Darth Bane books touched on this. The physical saber skills learned in training are usually pretty basic. The idea is to learn the basic moves to the point of muscle memory, then when fighting let the force guide you to the next move so that the moves come quickly and effectively. Of course, more advanced skills can be learned, but that's how they explained it. I suppose when considering force users I have to step back from traditional thinking where combat is more perception. Jedi and Sith are more about prediction. So yeah, from what I've read in the old EU and the current, I agree, even basic melee skills are enough to make a force user effective. I think it’s now over a week since the last ‘soon’ & I think I’ve seen a few tweets from FFG prior to that that have gone unrealised. Someone on reddit said that squadrons are able to be ordered right now. So, have fun with that mess. Cant wait to see $100 squadron packs on ebay and posts of "I bought 10 packs luls"
Our store owner just got his hands on a pack. It's marked $40 in store right now. I told him to hit ebay if needs to sell it at that price, in a few weeks it's only gonna be worth $15. Can't you report him for that? I wouldn't even if I could. I'm a firm believer that MAP is BS and stores should be allowed to sell product they purchase for whatever they want. (Not that MAP applies here, since he's selling over the standard cost, which from what I understand is 100% okay by those rules). That's awfully convenient. I wonder why Jedi spent a lifetime with training and the Sith spent millienia in collecting knowledge when all they would have to do is to tap each other's mind. Seriously, that's the best they came up with?! Back on topic: Did you know that we are one day closer to thenext article? Well, not everyone is going to like it. "I wonder why Jedi spent a lifetime learning to deflect blaster bolts with a lightsaber when they could just stop them with the force?" "I wonder why Jedi spent a lifetime learning lightsaber combat form when they could just catch lightsaber blades with their hands?" 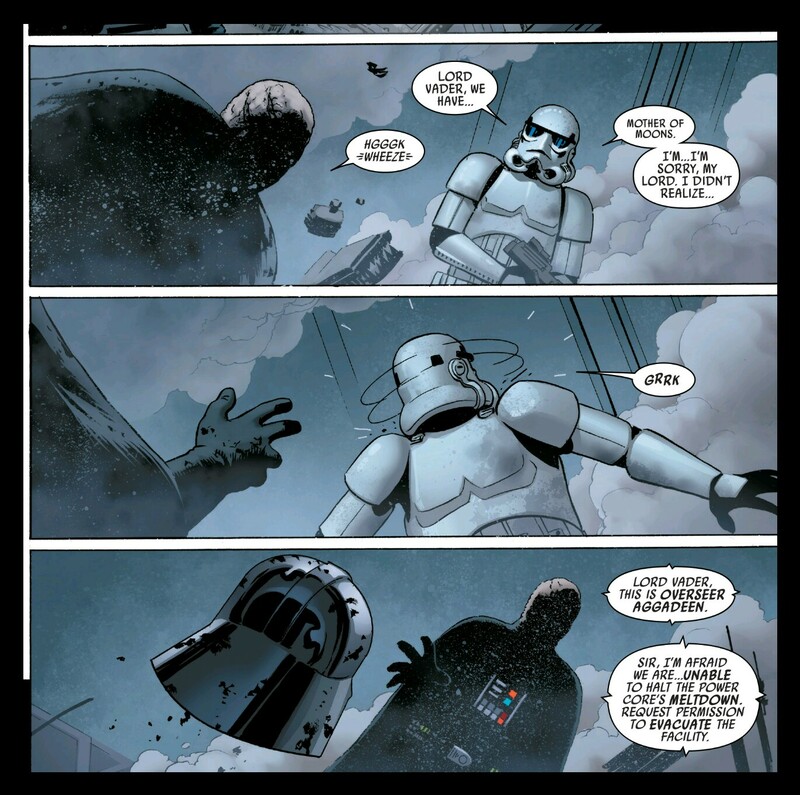 Any time something NEW happens, intentional or not in the SWU it's always going to have a "why didn't it happen before" reflection on the series. "I wonder why doctors spent lifetimes learning amputation techniques when they they could have just used penicillin." lol I don't know, take it for what it is. I was just tryin' to be informative and I don't think anyone is arguing, but point taken. @ovinomanc3r @Norell @kmanweiss Let's keep it clear of this thread, PM if you wanna talk about it further though.